Six bedroom house in St John’s Wood Conservation Area, NW8, near the famous Beatles crossing and the Abbey Road Studios. Complete refurbishment with a new extension and a rear dormer. 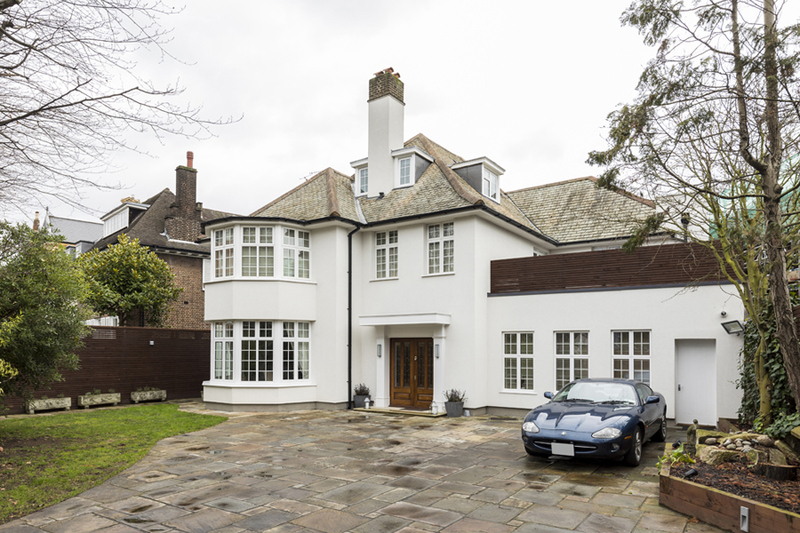 The new Owners purchased this grand and elegant detached house in St John’s Wood, London NW8, which was in a sound condition but needed modernisation. Apart from a complete refurbishment, we added a full width extension at the back and a rear dormer at the top floor. We obtained a planning permission from the Westminster Council for a large, full length rear extension. The structure has a modern orangery style with a white finish and a large roof lantern. The extension contains an open-plan kitchen and a family living space. It links to a double reception room, which is situated now in the middle of the house. The kitchen area is made of a single wall of tall cabinets consisting of a large fridge, a full height wine fridge, built in oven, a breakfast pantry and storage. A kitchen island is opulent in size and contains a hob and a sink and plenty of additional storage. The white kitchen island is adjacent to a wooden breakfast bar. The second part of this orangery style extension is occupied by a living-TV area with a feature stone tiled wall. The floor has been covered with wood effect tiles for a stylish look and convenience. A double reception room has been created in the middle part of the ground floor. The space boasts full height wooden joinery on both sides of a faux fireplace with a wide marble surround and a back-lit onyx slab in the centre. Brown marble tiles have been used for the floor. The same floor tiles have been used throughout the majority of the ground floor, including the large entrance hallway and the dining room. The layout of the ground floor incorporates some additional spaces, such as a guest bedroom and a staff kitchen. The guest cloakroom has been almost completely made of brown marble, including a long sink. A back-lit onyx panel has been integrated in one of the walls. The master bedroom has been kept in neutral beige shades. The master bathroom is very spacious and light. The floor and walls have been covered with white and grey marble. It contains a free standing oval bath, his and hers vanity units on both sides, as well as a large walk in shower. A home office with plenty of bespoke wooden joinery is in a close proximity to the master suite. The loft space has been completely redesigned. The floor contains additional bedrooms and a bathroom with a uniquely designed overhead shower under a ceiling that is slopping in three directions. The common space outside the rooms have been adapted as a family games and TV area with a comfortable L-shaped sofa. Both front and rear gardens have been redesigned to give more space for the family. A barbecue by Sub-Zero Wolf has been installed in the back garden.